Leading small business lender Liberty Capital Group is currently celebrating its 15-year anniversary. Starting out delivering equipment finance, the business switched to providing general business funding for small businesses across the country in 2010. Since then, after lending over $150 million, they have experienced significant success and growth. Partnering with ABC10 news for its business segment, called, “Banking on Business,” will allow Liberty Capital to showcase its lending programs. 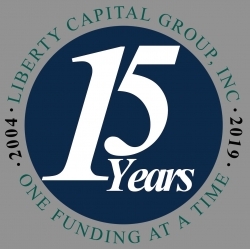 San Diego, CA, April 05, 2019 --(PR.com)-- Liberty Capital Group, a leader in providing funding for small businesses across the country, is celebrating 15 years of business success since its launch in November 2004. Founded by CEO Adrian Dalsey, the business started out financing truck and construction equipment, but moved to general financing for small businesses in 2010 after spotting a gap in the market after the 2008 financial crash. While Liberty Capital Group saw initial success, from 2007 onward, Mr. Dalsey noticed that as lenders began tightening lending policy, this resulted in small businesses struggling to find the working capital they needed to prosper. He repositioned the company to cater to this emerging market, and Liberty Capital Group have gone from strength to strength since that decision was made. Recently passing a landmark, with $150 million in funding provided to small businesses all over the country, and also having to recruit new staff to meet demand, the anniversary year has shown growth and continued success for the company. As part of the celebrations for this 15th anniversary, Liberty Capital Group have partnered with ABC10 news for their business segment, called, “Banking on Business.” Hosted by long-time news anchor Bill Griffith, the segment shared Liberty Capital Group values, aiming to provide clear business guidance for its audience. Liberty Capital Group prides itself on its exceptional customer service and honest approach toward helping small businesses receive the funding they need to build and grow their business. Liberty Capital Group has the advantage of being able to broker loans much faster than traditional banks (usually within a few days), with minimal upfront costs to the borrower. With rapid growth and 15 years of success behind them, the team at Liberty Capital Group is looking forward to the next 15 years of lending achievement. About Liberty Capital Group, Inc.
Liberty Capital Group, Inc. is headquartered in San Diego, California, USA, America’s finest city. For over a decade, Liberty Capital Group has provided Small Business Funding in California and across the nation. As a trusted Small Business Funding specialist, LCG has helped small business owners access quick, reliable, and haggle-free small business loans. As a stakeholder in the American Dream, Liberty Capital Group makes it possible for any business to compete and grow in today’s economy. Liberty Capital Group is a minority and woman-owned privately-held company. Both founders, Jules Dalsey, CEO with a long-time business partner and co-founder, Duyen Bui Dalsey as the COO. Click here to view the company profile of Liberty Capital Group, Inc.
Click here to view the list of recent Press Releases from Liberty Capital Group, Inc.